Last Friday morning, members of Mountain Justice staged a sit-in protest in the office of Chief Investment Officer Mark Amstutz, following the Board of Manager’s decision to continue investment in fossil fuel industries despite a student referendum that urged the Board to divest. Later in the day, the Parrish Hall sit-in transitioned to a rally in Kohlberg Hall to disrupt the Board meeting taking place. “Our purpose was to ask Mark Amstutz, Greg Brown, Val Smith, and the Board: do you truly stand behind this policy? 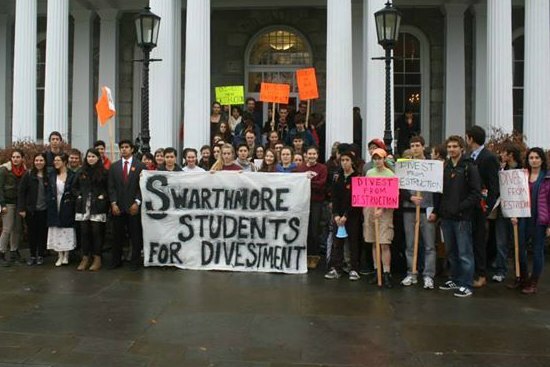 While we understand that some restraint around using the endowment for social purposes is important, these same standards would have prevented us from divesting from the South African apartheid, a decision that we hope the entire Swarthmore community is glad the Board made,” said members of Mountain Justice in a statement. According to members of MJ, 80 students plus a few faculty attended the sit-in, and characterized the sit-in as going “smoothly.” However, according to a Daily Gazette article, a “tense confrontation” ensued between Director of Public Safety Mike Hill and another MJ member. MJ members further explained why they chose the sit-in as a method of protest. “We chose the sit-in because it was a concrete way for us to increase the pressure on the Board to take seriously the referendum and stop rejecting it simply because it would take social considerations into account when making investment decisions,” said the MJ members. By Friday afternoon, the protest transitioned to a rally at Kohlberg Hall, where a Board of Managers meeting was taking place. During the livestreamed rally on Facebook, protestors sang, chanted, and gave speeches. With students lying on the ground with arms spread wide, the rally concluded with a “die-in,” where students pretended to be dead for approximately 15 minutes. This was meant to be representative of victims of injustice, in this case, climate change. During the die-in, Dean of Students Liz Braun announced that she would be escorting the board members and administration through the Kohlberg kitchen door to not interrupt the protest being held. Members of MJ said that the board’s refusal to engage directly with students was indefensible, in response. “Our goal is always to respect the rights of community members to engage in protest as long as it does not disrupt the business of the College. President Smith and Board Member David Singleton ’68 separately spoke with the students at the sit-in and both had pleasant exchanges,” said Braun in a statement after Friday’s events. She later reiterated the Board’s response to the referendum that had been emailed to the campus a day earlier. Members of MJ concluded by reiterating their stance on divestment and citing other institutions that had divested from fossil fuels.